There’s no time like the present to kick back before kickoff. As football teams from around the country compete for dominance on the gridiron, men, women and children in cities large and small are competing for dominance of the neighborhood football party. At Sardella’s, we’ve got pizza and beer delivery covered. 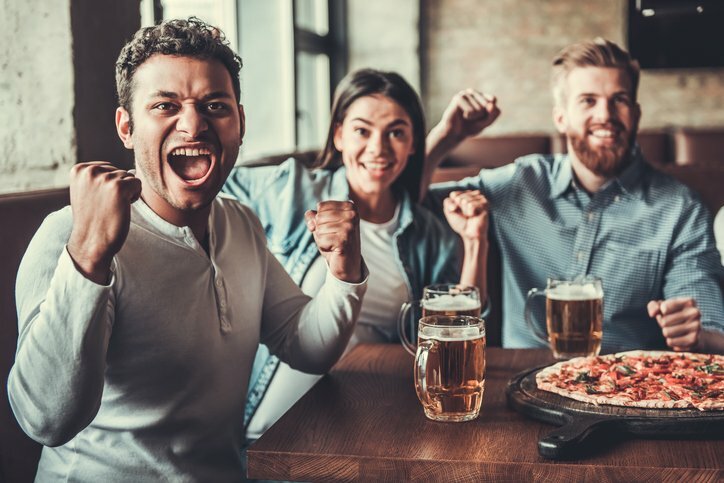 Feed your crowd by taking advantage of our football pizza specials and host a winning football party for your friends and family every time. From stocking up on regular and boneless wings to making sure the fridge is fully loaded with beer and soda, the following are some tips that take a ho-hum party and turn it into the football blowout the whole neighborhood will remember. Always stock up with plenty of food for the party. It is best to have extra pizza, chips, dips, drinks and wings than to fall short before the clocks runs out in the fourth quarter. Be sure to choose colors that represent the teams taking to the field. Even better, get custom plates, cups and napkins emblazoned with a team name and logo. This will give every guest one more way to show his or her team spirit. It’s a great idea to have a side game or two ready to go. This will fill up time before the actual game and during halftime. Bags, touch football and football pool are always popular choices for kids and adults alike. Sweet treats help soothe the burn of even the most searing defeat. Chocolate, ice cream, cake and cookies can keep everyone smiling even if the final score comes down in the other team’s favor. Try our new cinna-bread for a delicious pick-me-up to keep those spirits high – win or lose. We live in Arizona, so you probably don’t need to be reminded that it’s a good idea to keep plenty of ice on hand, but just in case: Don’t forget the ice for the big day. Lots and lots of ice! One of the best ways to prepare for your game day event is to get a headcount and plenty of information about what people like and don’t like. Are there vegetarians in the crowd? We can handle that! Do you have gluten-intolerant friends? Let us show you what we’ve got! You can even create a limited menu and ask everyone what they want before you place your order! This will ensure you have everything from pizza and garlic knots to regular and boneless chicken wings to suit the tastes of all your guests. With the help of Sardella’s and the upcoming season, it’s game on for your best football party ever!